Plan of both Roman cities of Corduba on the actual plan. It often happens that Roman cities are created from military expeditions. In this case, it is not like that, since this village existed before Romans arrival, but its development comes after the establishment of military troops at this area. Original colony was founded by Marcus Claudius Marcellus, a Roman consul who visited this village at least twice: one year each time. At 152 b.C. Corduba was a Latin colony and went on being so until the end of the Republic. Its strategic value at Ulterior Hispania made it outstanding as a military center. Therefore civil population -native and Roman- were invited to look after the troops. The city was walled: this wall is the most outstanding remaining from this age. As it was governed under Pompeius partisans, Corduba was almost ruined after Iulius Caesar's armies victory after civil wars -battle of Munda-. Anyway, it kept its priviledges. Its military position made it be still a great city. Demographic recession after civil war was enough to eliminate Caesar's enemies. Administrative reforms by Augustus, made Corduba the capital of Betica province -Colonia Patricia Augustea-. This fact caused that the city improved and created services for a great urbs: a great urban reform was done. 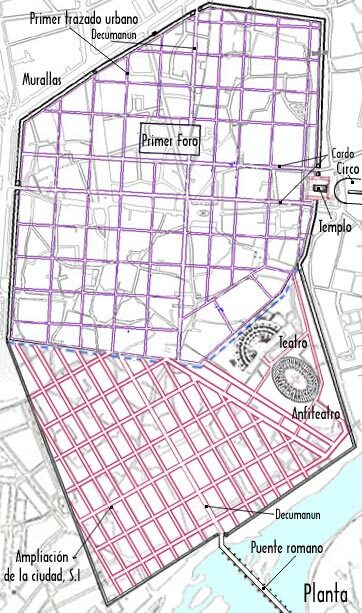 Walls increased, Via Augusta -that crossed the whole city- became Decumanus Maximus and a great bridge on Guadalquivir river was built as a new access to the city. Beside an aqueduct was constructed -Aqua Augusta-, gutters and public fountains. Many comitiums with associated areas -vicus- were designed on the urban net. At Corduba vicus Augustus, Forensis, Hispanus, Patricia and Canteris can be seen. There were also residential areas out of the walled center. They were for high society, as pagus Augustus or for general people, as Secunda Romana. City also improved under a social view: many schools were created, centers for worship, a new comitium... All that caused that great politicians were born in Corduba. This is the outstanding case of Seneca, a stoich philosopher and a master for Nero. From Augustus age up to the end of 3rd century A.D. -highimperial age- this city lived its golden years. Many works already begun will be finished these days: the theater and walls; others were redecorated in marble, the most usual material. At Tiberius age the new provincial comitium was consolidated -forum novum- with a new and high temple for Imperial worship. Imperial Palace of Maximianus Herculeus. BASIC INFORMATION. 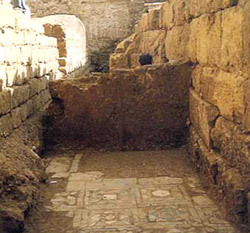 Domus in Corduba were slightly changed in order to adapt them to Corduba weather: scarce exterior windows, flat façades... Peristylum -porticated patio- had a distributional function, but it is also an element for illumination and ventilation. They used to have two floors, doing a great part of daily activities at lower -not at the upper one- because of warmth. As can be supossed, remainings preserved come from high level areas. The wall. It is formed by two parallel walls separated by ca. 6 m. built with big ashlars. Space between walls was filled with little stones in order to make easy access to watchtowers. Towers had a round plan and were ca. 5m. high with battlements. Theater and Amphitheater. They are well studied, but there only remains a part of the rows. Two aqueducts. A city like Corduba endowed with fountains, termae and more than 100 domestic houses made necessary constructing two aqueducts: Aqua vetus Augusta and Aqua nova Domitiana Augusta. The old one -vetus- was built at August age and the most part of it was underground -18 Km-. It was constructed with opus caementicium. Its inner part was waterproof with opus signinum. It was ca. 1,20 m. high and 0,60 m. wide. Original parts of this aqueduct did survive. The new one -nova- was built at Domitianus age (81-96) and made better an earth unevenness to reach the vicus Hispanus. It did so with a gate that shows the inscription "Aqua nova Domitiana Augusta" that gives it this name. The Necropolis: There are remainings of necropolis at both sides of "Via Augusta", from two similar Mausolea at the city's entry and an Hypogeon. Bridge over Guadalquivir. It was also built at August age in order to sav the access from Via Augusta. It had 17 gates: today 16 remain, but only 14th and 15th keep their original form and craft. The others have been restored several times. These modifications were made for mending or aesthetical reasons rather than structural. Archs have different ways and are supported by piles with cutwaters and wedges of variable plan, because of frequent modifications. Its passing by surface is horizontal with little slopes at the accesses.